Greek officials have launched an international campaign to try to identify a four-year-old blond-haired, blue-eyed girl found in a Gypsy camp in central Greece as the couple believed to have raised her face charges of kidnapping. "They will appear on Monday before a magistrate on charges of abducting a minor after DNA tests revealed they bore no relationship to her," said Lukas Krikos, a police official in Athens. "An extensive investigation is under way around the Roma camp in Farsala, where she was found." Police found the child, with her conspicuous deep-set blue eyes and pale skin, when they conducted a raid on the settlement 170 miles north of Athens in search of weapons and drugs. The girl appeared disoriented and confused by the abrupt change in her environment when she was taken into the care of a children's charity. "She communicates mostly in the Roma dialect and understands only a few words of Greek," said Costas Giannopoulos, who heads the charity, called Smile of the Child. Greek authorities said it was imperative that they find the child's real parents so they could understand how she ended up in the camp. A global search has been initiated through Interpol and international children's groups. Police say the suspects, a 40-year-old woman and a 39-year-old man, have given a range of explanations, from the girl being found in a blanket to her having a Canadian father. The woman, who was found to have two identities and 14 children, claimed to have given birth to six of them in the same year. At least three were registered in different parts of Greece. "This case has reinforced our suspicions of Roma involvement in child trafficking. We have discovered how easy it is for anyone to register children as their own," Giannopoulos told the Observer. "Blond, blue-eyed children are clearly being targeted." The parents of Madeleine McCann, the toddler who went missing in Portugal in 2007, said the case gave them "great hope". It could also help crack the mystery of Ben Needham, the Sheffield boy who went missing on the island of Kos in 1991. 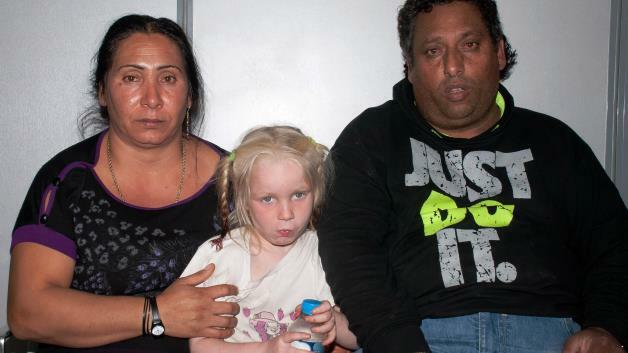 Greek police have asked Interpol to help them track down the real parents of the blonde girl with blue eyes who was found in a Roma settlement near the town of Farsala. Police spotted the child while doing a sweep on Wednesday for suspected drug trafficking. The girl was found on Wednesday at a Roma settlement near Farsala. Police suspect she was either abducted or trafficked. Greek police are investigating the identity of a four-year-old girl found living with a Roma couple in central Greece, on suspicion that the child may have been abducted from her parents. The girl was found on Wednesday at a Roma settlement near Farsala in central Greece during a police sweep of the settlement for suspected drug trafficking. Roma children play in a Roma settlement in Farsala, central Greece, on October 19, 2013. Police became suspicious because the blonde-haired, blue-eyed girl bore no resemblance to the couple claiming to be her parents, and the couple changed their story about how they got the child several times under questioning. A Roma woman walks next to the house where a 4-year-old blonde girl lived in Farsala, central Greece, on 19 October, 2013. "The girl looks Scandinavian or could be Bulgarian," said a police official who declined to be named. "It is either a case of abduction or trafficking." Roma people stand in a Roma settlement in Farsala, central Greece, on October 19, 2013. DNA tests confirmed the child was not their offspring. Police are preparing criminal charges for abducting a minor and securing documents under false reasons. The girl is now in the custody of the Smile of the Child organization and a prosecutor has asked that her photographs be published to help find her true parents. A poster of a four-year-old girl known as Maria, who was found living with a couple in a Roma camp in central Greece, is pictured in the office of the "Smile of the Child" charity, which is taking care of the child as police search for her biological parents, in an Athens suburb. Police said the 40-year old purported mother was found to have two different identification documents and two different family registries, one showing her as the mother of five girls and a boy and the other as the mother of four girls. Greek cops became suspicious after realizing the girl looked nothing like her supposed parents. The registries showed she had given birth to six children within a period of less than 10 months. DNA test confirmed that the child did not belong to the Roma couple. “The girl looks Scandinavian or could be Bulgarian,” a police officer said. She's absolutely adorable! I hope they find her real parents; and I hope her real parents aren't complete asshats. Poor little girl, hope very much that her future will be good after such an ordeal. Hope they find her real parents and they want her back. I would have said definitely of Nordic stock including the Sami/Uralic peoples. I'd be looking north as Norway, as south as Ukraine, as west as Poland and as east as Russia. I don't think Bulgaria though, but it's possible. quite sure they can determine what part of europe she's from using her dna. hate these thieving roma bastards. Cute kid, lets hope the parents are found. *UPDATES* American Couple: Is Mystery Girl Found in Rome Our Daughter? I could not find my original post. The FBI is joining the international authorities searching for the parents of the 4-year-old girl now known as "Maria," who was found in a Roma camp. NBC's Michelle Kosinski reports. ATHENS -- An American couple whose baby daughter vanished from their Kansas City home two years ago, has contacted authorities in Greece who are trying to solve the mystery surrounding a blond girl found in a Roma camp. Jeremy Irwin and Deborah Bradley, whose 10 month old daughter Lisa Irwin disappeared in October 2011, got in touch with the The Smile of a Child charity that is heading up the hunt for the girl's biological parents, a spokesman confirmed to NBC News on Tuesday. John Picerno, a lawyer for the family, said he had contacted the FBI and the couple’s interest in the girl’s discovery had been registered. "The (FBI) agent has made an official inquiry through governmental channels with the authorities in Greece," he said. "We are awaiting a response from them, which we anticipate will be forthcoming as soon as possible." 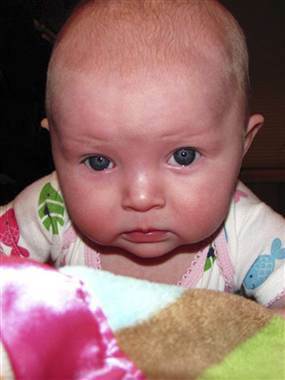 Lisa Irwin has not been seen since October 4, 2011, when her father came home from work to find the door unlocked, the lights on and the crib empty. The chances of the girl -- who is known as Maria -- being Lisa Irwin appeared to be slim because a dental examination suggested Maria is between five and six years old. A spokesman for The Smile of a Child charity told NBC News that of the 10,000 calls and emails they received around eight or 10 were being more closely looked into, including cases in the U.S., Sweden, Poland and France. Police raiding a Roma – or Gypsy – camp in central Greece found a young fair-skinned, blonde girl who was living with a couple later proven not to be her parents. NBC's Michelle Kosinski reports. Kostas Giannopoulos, the charity's president, said that although Maria remained in a Greek hospital, she was in, "good condition," and making progress. Previously, Maria had only spoken a few words in the Roma dialect as well as Greek, although police think she may be of northern or eastern European origin, possibly from Scandinavia or Bulgaria. Giannopoulos added that she had been a little picky about her food and a little stubborn. “When communicating she mostly communicates about the present and not the past," he added. Maria was spotted peeking out from under a blanket last Wednesday as police swept the Roma settlement for suspected drug trafficking near Farsala, a small town around 170 miles north of Athens. Roma also have been called Gypsies, though that term is considered derogatory. Officers told Reuters the couple gave at least five conflicting accounts of how the child ended up with them, including that she was found outside a supermarket. Confused that her coloring did not match that of Christos Salis, 39, and Eleftheria Dimopoulou, 40, who were claiming to be her parents, police ran DNA tests and discovered they were not biologically related. The woman had two different identification documents and other papers suggested the couple had up to 14 children, but six were registered as having been born within less than 10 months. They received 2,790 euros, ($3,800), a month in child benefits, a police source told Reuters. The couple faced magistrates on Monday to respond to charges of abduction and procuring false documents but were ordered to be held in custody until they face trial. A date has not been set. They denied snatching Maria and said her mother handed the girl to them shortly after giving birth, one of their lawyers Constantinos Katsavos, told reporters outside the court. She's being called the "blonde angel," and it was a four year old girl's blonde hair and pale skin that led to her rescue. The search is now on for her parents. NBC's Duncan Golestani reports. "It was an adoption that was not exactly legal but took place with the mother's consent," he said, adding that is what the couple testified. Police have sent Interpol a file with all the evidence they have on the girl, including DNA samples, to seek a possible match with records of missing children. The possibility of a smuggling ring - in which pregnant women were brought into Greece from Bulgaria and their children put up for sale - was also being investigated, according to Greek state-owned news agency Amna. Officials had gotten a tip-off that a young girl was living with the large family but looked nothing like her brothers and sisters, Ireland's Sunday World reported on Tuesday. The child has been taken into care while the investigation is ongoing, the paper reported. Eleftheria Dimolpoulou, left, and Christos Salis, right, are seen with Maria. Lisa Irwin vanished from her home in Kansas City, MO, in October, 2011. The baby picture looks very convincing to me!